"People get stuck in loops," says DJ/producer Fred Everything near the beginning of the excerpt from the video "Fred Everything House Music Template and Workflow." He says people who write and and arrange loop-based music should think horizontally—in other words, about the song evolving over time. He says that's superior to taking a vertical approach, by which he means focusing on one short looped section at a time. If you're too vertically focused as you build your arrangement, he says, you'll feel the need to put too many parts in a short segment, rather than spreading your ideas out over the course of the song. His overall point is that you make better music when your arrangement decisions are based on reacting to what you hear as the song goes along. 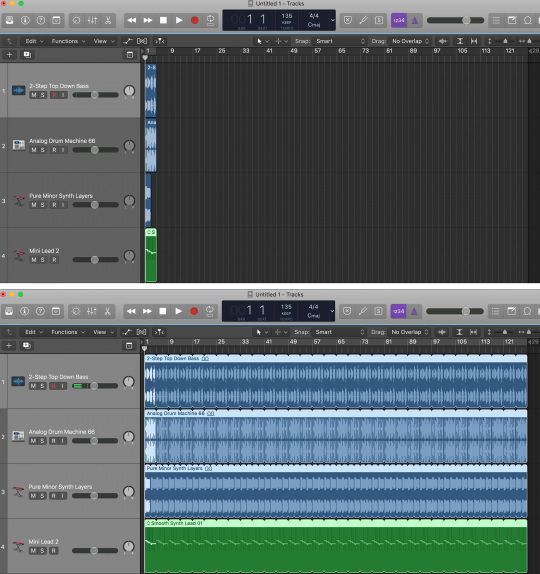 Working in Apple Logic Pro, Everything demonstrates how he sets up his tracks when he's starting to work on a song and shows the key commands he employs. He recommends pressing the C key to turn off the Cycle, which is a user-definable loop region. When active, the transport automatically jumps to the start point of the Cycle and will continue looping until you hit Stop. To make sure he stays focused on the big picture, Everything likes to take the basic loops he's starting a song with and extend them out to roughly the length he wants it to end up at. 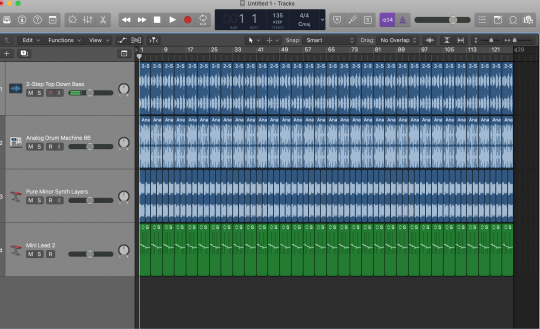 In Logic, it's easy, he says, you just select the tracks or the loops themselves and press L, and Logic automatically extends them out to the Project End Marker. Or, you can just drag them manually to lengthen (or shorten) them. By extending out the loops, it forces you to act on a full-song structure, which is a good thing. The top screen shows loops in their original length and the bottom shows them extended using the L command. As soon as you start working on your extended structure, he points out, it won't take that long until you realize that you're at around three or four minutes in and it's time to start thinking about how you're going to end the song. He says that seeing that you've made progress like that creates a feeling of encouragement. Conversely, if you're working only on a single short section for a long time when you're done with it, all you have is a small part of the total song, and that can have the opposite effect. The copies that Logic makes when you use the "L" command are aliases, not actual audio or MIDI files. He suggests that after you've extended out the loops, it's best to convert them from aliases to actual files by selecting the tracks or regions and pressing Control-L. When you do, each alias turns into an individual file. He also talks a bit about the intro section of a song. He says that in House music, you usually start with a number of bars of just beat (or sometimes a beat along with a simple keyboard part) to provide a DJ at a club with a "mix in" section to that allows for easier transition from the song before. Pressing Control-L separates the extended loops into individual files. You can use this command with audio or MIDI tracks. 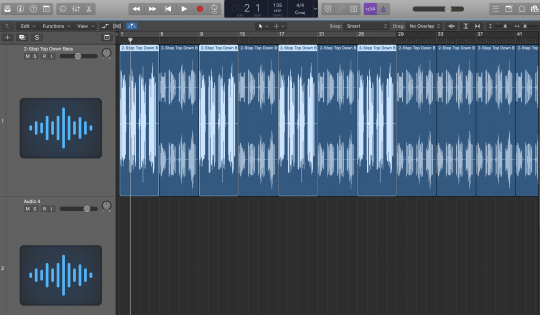 Let's look at some other cool things you can do to edit loops in Logic. Continuing from where Everything left off in his example, let's say you have the basic loops for your song extended out and turned into audio files from aliases. Now, if you want to mute an individual loop, say you want it to drop out for one time through, select the region (audio or MIDI) you want to mute and press Control-M. You can even select non-contiguous regions to process by shift-clicking them. You can select non-contiguous regions for processing by shift-clicking. The Selection-Based Processing feature lets you apply effects destructively to a region or regions. You can edit loops (or any audio region or regions) in Logic's Audio File Editor, which opens as an integrated section in the main window by double-clicking on the region you want to edit, or as a separate window by pressing Command-6. 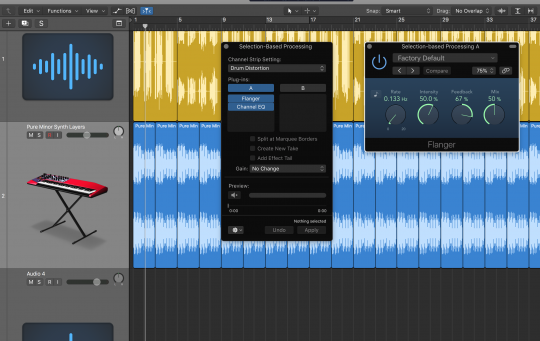 In the Audio File Editor, you can audition your loop independently of the main transport by pressing Control-Option-Command-Spacebar to start or stop playback. You can loop it by pressing the loop icon in the toolbar on the upper right. The Audio File Editor's Function menu contains a number of processing options including Reverse, Normalize, Change Gain, Invert (phase), and more. In order to have this menu available to you, you must have Advanced Tools turned on, which you can do at Logic Pro X/Preferences/Advanced Tools. Then select the Audio checkbox or, to turn on all the optional editing features, press the Enable All button. 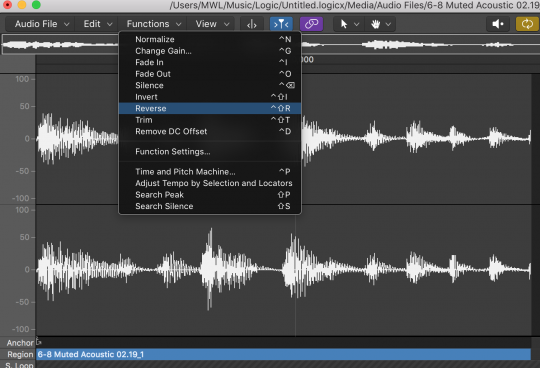 Logic's Audio File editor has some powerful processing features under the Function menu. Note that if you're editing one of the built-in Apple Loops, you won't be able to process it in the audio editor until you first convert it from a CAF to an AIFF file. Control-click the loop you want to convert, press Convert to New Audio File, then select AIFF in the File Format pull-down.